Chinese authorities are continuing to tighten security following days of protests by Tibetans in the main city, Lhasa, and in surrounding provinces. In one town in Gansu, a BBC journalist saw rows of armed soldiers and heard broadcasts telling people to surrender. On Thursday, China admitted for the first time that troops had shot and injured protesters during the unrest. "If freedom-loving people throughout the world do not speak out against China and the Chinese in Tibet, we have lost all moral authority to speak out on human rights," Ms Pelosi told a crowd of thousands of cheering Tibetans, including monks and schoolchildren. Anti-China protests began on 10 March in Lhasa and gradually escalated, spreading to Tibetan communities in neighbouring Gansu, Sichuan and Qinghai provinces. 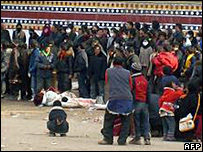 China says 13 people were killed by rioters in Lhasa. The Tibetan government-in-exile says at least 99 people have died in a crackdown by Chinese troops. China is not allowing foreign journalists into Tibet. Troops have also sealed off towns in the surrounding areas where unrest has taken place, witnesses say. But the BBC's James Reynolds spent 24 hours in Hezuo in Gansu, where earlier this week Tibetan protesters tore down the Chinese flag. 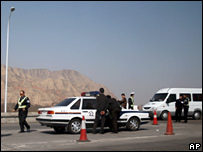 Chinese security forces had overwhelmed the town and the streets were full of police cars, check points and military trucks. On the southern entrance to Hezuo there were rows of soldiers carrying AK47 rifles and bayonets, our correspondent said. Public notices and police broadcasts told protesters to surrender by midnight on 25 March or face arrest and punishment. Other witnesses have reported seeing hundreds of troop carriers heading for Tibetan areas in recent days. On Thursday Chinese authorities admitted that members of the security forces had fired on Tibetan protesters. Police wounded four protesters "in self-defence" last Sunday in Aba county, a Tibetan area of Sichuan province, Xinhua news agency said. An earlier Xinhua report said police had shot the four dead, but it was quickly changed. Xinhua did not provide further details of the incident, but Tibetan activists say at least eight people were killed at a demonstration against Chinese rule near the Kirti monastery in Aba on Sunday. Earlier this week, the Tibetan Centre for Human Rights and Democracy circulated photos of bodies with apparent gunshot wounds, which it said were the result of police firing indiscriminately at protesters. On Thursday, US Secretary of State Condoleezza Rice held telephone talks with her Chinese counterpart, Yang Jiechi, in which she urged Beijing to show restraint. But Mr Yang told her that the protesters were trying to sabotage both the Olympics and social stability - and reiterated China's position that it blamed the Dalai Lama for the violence. The Dalai Lama - who in 1989 won the Nobel Peace Price for his commitment to non-violence in the quest for Tibetan self-rule - has called for talks with Chinese President Hu Jintao.